Summary: Oil painting showing a dark sky and rough sea. A storm is raging. A damaged boat is sinking. A rainbow arcs over the boat. Description: Francis Danby: Danby's life was an unhappy one. He was denied professional recognition because of his relationship with his mistress Helen Evans and this hampered his career. He had ten children but by 1851 four of them had died and the survivors had either left him to live with their mother in England or moved away to pursue their own careers. He ended up living alone in Exmouth, suffering from failing eyesight, with his last hopes of Academy membership dashed. 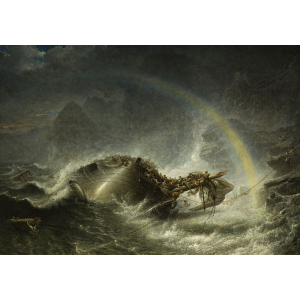 'The Shipwreck' is sometimes seen as an epitaph on his own tragic life, painted just eighteen months before his death. 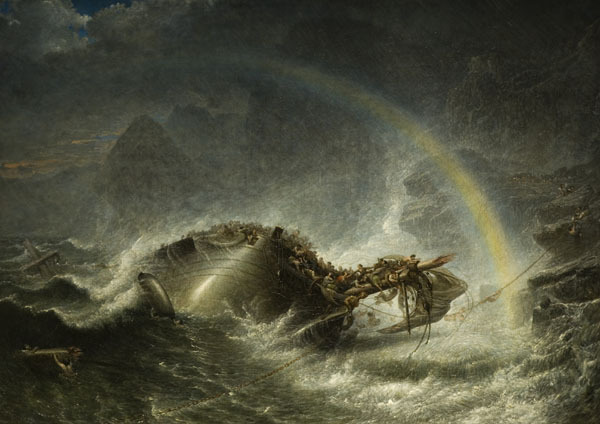 Wolverhampton Art Gallery owns 'The Shipwreck,' exhibited at the Royal Academy in 1860. Ironically, the ship is named 'Hope.' However , the rainbow is a symbol of salvation and many passengers might well have saved themselves by climbing on to the rocks in the background. Another symbol of hope, a cross formed by broken mast, rises from the water. The 'Hope' is an emigrant ship packed with men, women and children bound for a new life far away from home. The 1850's saw large-scale emigration from Britain to America and Australia. In a strange twist of fate Danby was to be shipwrecked himself, off the Devon coast, soon after he completed this picture.